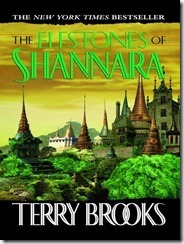 The Elfstones of Shannara is the second book of Terry Brooks’s Shannara series. It begins years after The Sword of Shannara. The magical Ellcrys tree - created by the elves millennia earlier to imprison the evil demons - has begun to die, allowing the demons to regain their strength and attack men and elves. Wil Ohmsford - grandson of Shea Ohmsford, hero of the first novel - is assigned the task of re-planting the Ellcrys. He needs the help of the elven princess Amberle, who is chosen to protect the magical tree, but has run away from her king and family. To protect her on his quest, he uses the power of the mystical elfstones left to him by his grandfather. It becomes a race for Wil and Amberle to find the hidden Ellcrys seed and restore the Ellcrys before the emboldened demons attack and destroy men and elves of the Four Lands. Terry Brooks knows how to tell a story, but it troubles me that he borrows so much from JRR Tolkien. It's not just that his world is populated with elves and dwarves. Major parts of the story are lifted directly from Tolkien. The young, reluctant hero goes on a quest to save the world from evil creatures, armed with a magical talisman that was left to him by an older relative, who went on a similar quest in an earlier book. We could easily substitute Bilbo, Frodo, and the Ring for Wil, Shea, and the Elfstones. But, the stories are entertaining if not told with Tolkien's magic. It's a good introduction to the world of fantasy for those who want something more accessible than Lord of the Rings. Azure provides several ways of managing resources through scripting users. You can write scripts in either PowerShell (a popular Windows tool for managing servers and IAT resources) or CLI (a Bash-like scripting language that runs on Windows, Linux, and MacOS). To use these tools, you need to have them installed locally, along with any support tools, such as the Azure PowerShell commandlets. Recently, Microsoft released the Azure Cloud Shell - a browser-based command-line interface built into the Azure portal. By opening a Cloud Shell from the Azure Portal, you can execute PowerShell or CLI scripts from within your browser, without installing anything. 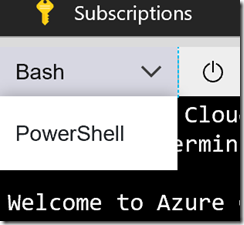 To open Cloud Shell, navigate to the Azure portal and click the [Cloud Shell] button (Fig. 1) on the top tool bar. It may take a minute to retrieve and connect to a Cloud Shell environment (Fig. 2), but soon you will see a window with a command prompt, as Shown in Fig. 3. The Cloud Shell in the image is configured to run CLI scripts. You can tell this by the dropdown in the window's top left corner. You can also run PowerShell scripts in a Cloud Shell window. To change the script types, click the top left dropdown and select your desired scripting language, as shown in Fig. 4. Fig. 5 shows the Cloud Shell with PowerShell selected. You don't need to log into the Cloud Shell environment. It will assume the account from which it was launched. to create a new resource group named "myrg" in the Southeast US region. You can even do other bash commands, such as ssh into an Azure Linux VM. Cloud Shell automatically creates a container within an Azure VM to host your session. Although this container is destroyed shortly after you disconnect, Cloud Shell also creates a storage account to persist files or settings you use when using this interface, so they will be there when you return. Azure Cloud Shell provides an environment for you to execute automation scripts and other administrative functions. 2017 was a year of change. I started a new job; I traveled for the first time to South America, the Czech Republic, Iowa, Oregon, and Los Angeles; I returned to Canada for the first time in 10+ years; my son Tim graduated and began his professional career; and my son Nick accepted a new job in Massachusetts. Microsoft went through a major reorganization last year and it greatly affected my department and my job. I moved to a new team that is focused on helping professors at Top Computer Science universities teach their students about cloud computing. This role involves even more travel than my last one. For the past few months, I've been visiting schools around North America and my calendar for the next 2 months is filled with campus visits for hackathons, guest lectures, workshops, and meetings with students, and professors. I won't be home much in January and February. I traveled more and farther in 2017 than I have in a long time (if ever). I visited 7 different countries (Romania, Sweden, The Czech Republic, Uruguay, Argentina, Canada, and the US) and 17 states. It was my first visit to the Czech Republic, Uruguay, and Argentina. Prague has long been on my list of places to visit so I was thrilled to finally get there and I enjoyed the hospitality of Gael Fraiteur and Brit King. Gael and I drove down to Český Krumlov - a small village in southern Bohemia preserved as it was in the 18th century - where we spent a night and explored castles, museums, and restaurants. I was happy to accept an invitation to speak at .NET Conf UY, primarily because it was my first trip to South America. After a few days in Montevideo, Uruguay, I took a ferry to Buenos Aires, where I spent an afternoon exploring the city on foot. In May, I scheduled tour to speak at 4 different user groups in 3 days in Iowa. My friend Javier helped me plan the trip and I was excited for my first visit to the Hawkeye State. In 2017, I got serious about my goal of seeing every home stadium and arena of the 4 major professional sports league. I visited 3 NFL stadiums, 4 NBA arenas, and 2 NHL arenas last year. With 55 places remaining, I will need to accelerate this process. In January, I flew to San Francisco, where my friend Sara picked me up and together we drove 7 hours to a small town in southwest Oregon to attend the funeral of the wife of an old friend. The next day, we attended the funeral and a dinner and repeated the trip in reverse. We were fortunate to have flexible enough schedules to make this trip and I'm really glad we did. And I got to know Sara a lot better on the trip. I made it a point to see a lot of live music in 2017. Most of the shows (Stanley Clarke, Buddy Guy, Guy King, Ladysmith Black Mambazo, Booker T. Jones, Marcia Ball, Delbert McClinton, Kris Kristofferson, Al Stewart, Jean-Luc Ponty, Benny Golson, Paul Weller, and Roy Ayers) were at small clubs in Chicago (SPACE, Buddy Guy's Legends, Old Town School of Folk Music, SPACE, City Winery, Jazz Showcase, House of Blues, and The Promontory), but I also saw Eric Church and Tim McGraw / Faith Hill at the cavernous Allstate Arena. My two sons also had some major changes in their lives. Shortly after graduating from Indiana University with a degree in Informatics, Tim accepted a job with Enkay Tech - an IT consulting company outside of Chicago. He lived with me for a few months before renting a house in Wrigleyville. Spending time with hi was one of the highlights of my summer. After 2 years serving as Director of Basketball Operations at Southern Illinois University - Edwardsville, Nick accepted a position as an assistant coach at Williams College in Williamstown, MA. He moved in the fall and his team have been ranked as high as #5 in Division 3. In December, I was able to see Williams play 2 games at a tournament in Thousand Oaks CA. Although most of 2017 was good to me, not everything was awesome. My mother passed away in June. A few weeks later, I was diagnosed with skin cancer, which was successfully removed. Not long after, a relationship ended after over a year of dating. Each incident was magnified because they came in quick succession, but I've recovered from them. My family and I were somewhat prepared for our mother's passing. She was 85 and the death of my father and sister in the past few years forced us to consider the inevitable loss of other loved ones. I am left with fond memories of her and of the girl I lost and this helps. And my follow-up appointment showed no sign of skin cancer. 2017 was an amazing year of growth for me personally. The changes are accelerating into 2018. My calendar is already full for the first 2 months and I am looking forward to the future with optimism.